If you walked into Captain America: The Winter Soldier expecting a typical comic book movie, then you were wrong. This is more of a political thriller and that is not a bad thing. Marvel is continuing to prove that they are willing to take big risks with their characters to tell a bigger story. The Winter Soldier is a great example of this. This film strikes a much different tone than Captain America: The First Avenger. In that film the Cap and friends are living in a very black and white world. The Nazis and Hydra are clear enemies and what they stand for is obviously wrong. But the world that Steve Rogers has been thrust into is far more nuanced. It is full of gray areas, and it’s often unclear who the real enemy is. This is the perfect backdrop for our hero from the past. How would he react to the contemporary evils of government surveillance and drone warfare? How would he perceive these measures meant to ensure civilian safety at the expense of personal liberty? These are not questions one would expect to be asked in a comic book film, but Marvel does an excellent job of addressing these issues within an entertaining package. Chris Evans continues to prove that he is the perfect Steve Rogers/Captain America. His character development has progressed believably since The Avengers, with Steve having created a “normal” life for himself in the 21st Century. There are a few great jokes involving his gaps in historical and pop culture knowledge due being frozen for nearly 60 years, but thankfully the script doesn’t go overboard with this. A friendship with Black Widow (Scarlett Johansson) is revealed through some witty banter, and it really does feel like these two have grown close in the last couple years. I’d also like to point out that her role in this movie is more crucial than her ridiculous pose on the movie poster would imply. Johansson is definitely more than just a hot body in a tight suit, and it bothers me that she is often written off as such. A great addition to the Marvel Universe is Anthony Mackie as Sam Wilson/Falcon. This is the first African-American superhero in mainstream comics, and it’s about damn time he was brought into the mix. Mackie’s portrayal is great, creating a character who does not stand in Captain America’s shadow. That’s actually one of the strengths of the Captain America series: he may be the lead, but those he works with are not merely sidekicks. They are very much his equals and he readily recognizes this. The Winter Soldier is definitely one of Marvel’s strongest films. It tackles some tough issues in an intelligent way, with enough explosions to thrill the target comic book movie audience. I’m excited to see what’s in store for Captain America, both within The Avengers and in his next solo adventure. One thing I will say about Marvel is that they are not afraid to take risks. They had just made a Captain America origin story wrapped up in a World War II adventure film, and continued Cap’s story with the best comic book movie ever made in The Avengers. 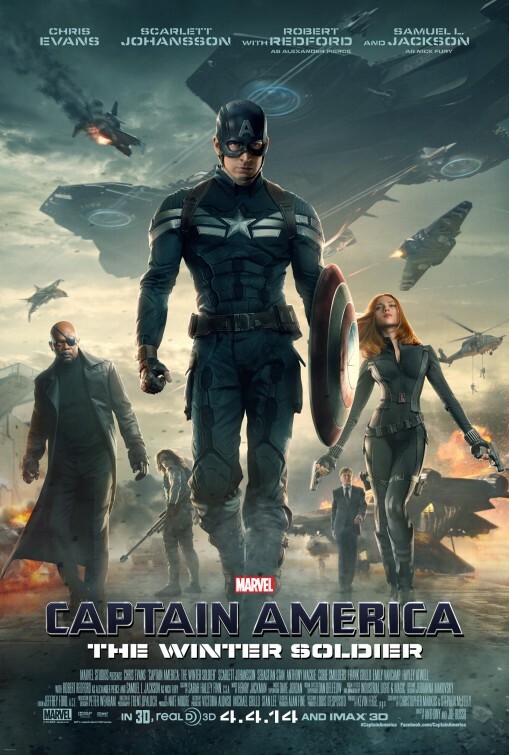 Instead of keeping the same tone for Cap’s third adventure, they have created a political thriller rather than a comic book movie. It is a risky move, but one that pays off for Marvel, as many of their recent ones have. You only have to look at something like Guardians of the Galaxy to see. Who was sitting in the Marvel board room saying, ‘hey, let’s make a movie about a talking raccoon and a giant tree’ and wasn’t immediately laughed out of the room. Captain America: The Winter Soldier picks up a couple of years after the events of The Avengers. Steve Rogers (Chris Evans) is still acclimating himself with the 21st century after being thawed out at the end of his first adventure. He is a fully fledged SHIELD agent now, working closely with Nick Fury (Samuel L. Jackson) and Black Widow (Scarlett Johansson). SHIELD is about to unveil a series of gunships that are going to protect citizens from the air, always in orbit and being able to attack at any time. Steve does not like the idea of there always being an eye in the sky watching people ready to pounce, but Fury assures him that these ships will only be used for good, and there is added pressure to ward off any future alien invasions like the one that happened in The Avengers. Eventually Cap uncovers a secret conspiracy to hijack not just this technology, but the entire SHIELD organisation. Caught up in the whole thing is his old friend Bucky (Sebastian Stan). Long thought dead, Bucky has now become the Winter Soldier (Hey!! That’s the title), a mindless assassin of Hydra. Can Rogers stop this conspiracy before it destroys SHEILD for good, and can he save his old best friend and help him remember who he was? This is one of Marvel’s best films. I know I said it earlier, but I am continually surprised by the decision this film company makes, and all of them so far have turned out to be winners. It goes to show you how diverse comic books are. People will write them off as childish nonsense, but this movie is based on a comic book and would fit right in with some of the classic political thrillers from the 70s like The Manchurian Candidate or All the President’s Men. It is nice to not always have to defend comic books anymore now these films have become so mainstream. I was getting tired of trying to convince people that there are very adult stories being told in these books and they are not just for kids. The Winter Soldier is a great addition to the Marvel cinematic universe, ordinarily it would have no competition as the best Marvel movie of the year. Unfortunately for Cap 2, this was also the year that a talking raccoon took the galaxy by storm. Coming second to the Guardians is not that bad though.